Everyone’s got an athlete within, but not every athlete is alike. So we put together the men’s activewear you’ll need for your favorite kinds of workouts (or workouts you’ve always wanted to try). Whether you’re pounding the pavement, pumping iron, scampering up singletrack, hitting the slopes, or just rocking a sporty on your downtime, we’ve got the gear you need to hit those 2019 fitness goals. You’re up early ticking off mileage, on the track burning repeats, and leaving your lungs in your tempo run. You need light, supportive men’s activewear that won’t hold you back. On Running Comfort T: The uber-soft, breathable Comfort T uses a blend of cotton, modal, and elastane to wick moisture and stave off odor for even the sweatiest of tempo runs. lululemon Surge Short: The four-way stretch and a no-bounce phone pocket ensure these men’s running shorts won’t screw up your stride. Athletic Propulsion Labs Techloom Pro: At 7.9 ounces, these men’s running shoes are as fast as a racing flat but with enough cushion to absorb long, slow distances. Brazyn Trek Collapsible Foam Roller: If you’re logging the miles, don’t skimp on recovery—this storage-friendly, collapsible foam roller targets trigger points and relieve sore muscles. 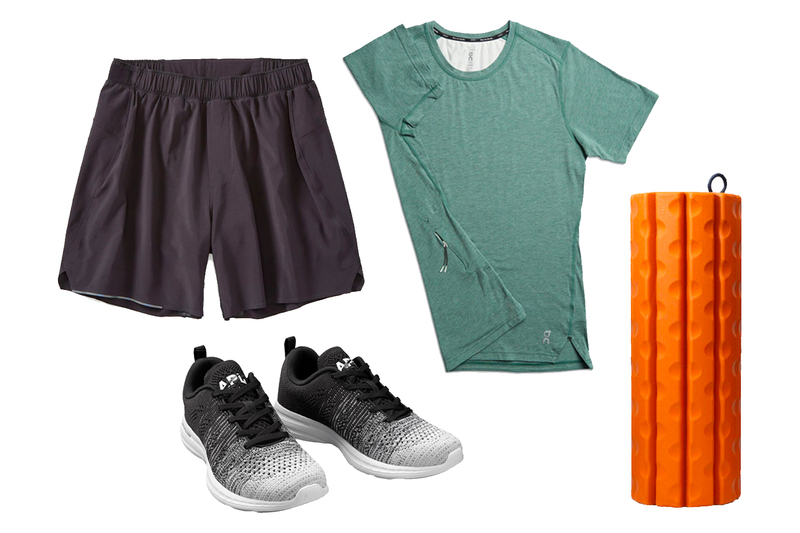 Whether it’s CrossFit, weight lifting, boot camp, or circuit training, you’re laying it all on the line, so you’ll need a gym gear full of the stuff that’s gonna help get you there. 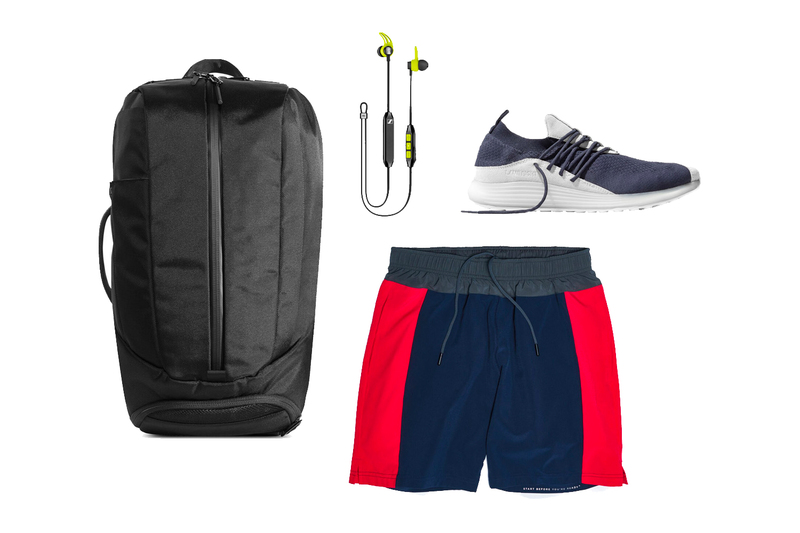 Aer Duffel Pack 2: The long center zipper on this gym bag ensures you’re never groping in the dark for your headphones, while the 1680D ballistic nylon exterior will outlast years of WODs. Fourlaps Bolt Short: These comfortable, breathable men’s gym shorts offer the kind of four-way stretch and a loose fit that’ll make it impossible to come up with a good excuse for skipping leg day. Lane Eight Trainer AD 1: The folks at Lane-Eight have mastered the men’s gym shoe with their Trainer AD 1, which has a light, responsive feel ideal for both box jumps and snatches alike (and an abrasion-resistant toecap to outlast ‘em all). The Sennheiser CX Sport: Our gym headphones of choice? These sweat-proof, long-lasting, tune-blasting workout amplifiers that’ll keep you motivated and focused through the final set. A little snow and mud (and a little blood) have never scared you—because even if it’s cold and raining, you’d rather be outdoors than on a treadmill. 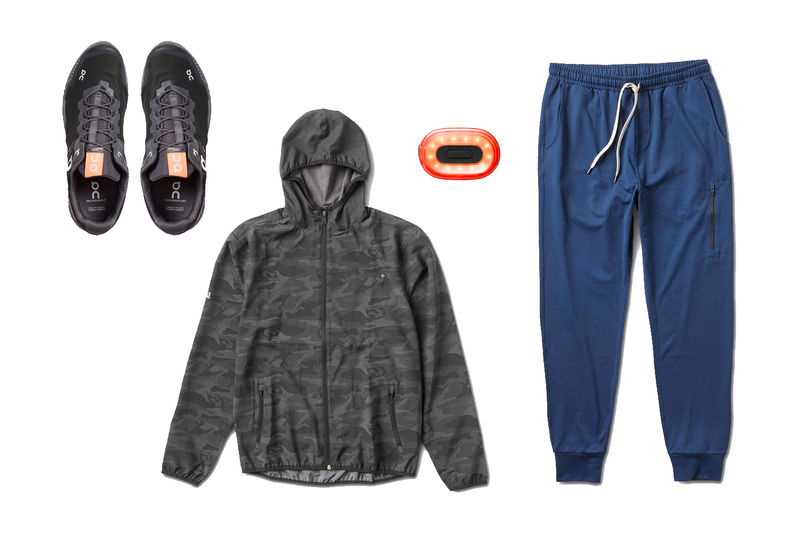 So you’re gonna need the men’s activewear to keep you safe and dry in any weather. Vuori Outdoor Trainer Shell: Technical trails demand technical apparel like this moisture-wicking workout shell, which features internal chest pockets to keep your wallet safe and four-way stretch to accommodate every stride. Vuori’s Sunday Performance Jogger: These cozy joggers offer freedom inside and out with front-leg and rear zip pockets. The moisture-wicking, comfy knit fabric makes it versatile enough to act as a pre-run warmup pant or an on-trail performer. On Running Cloudventure Waterproof: Wind- and water-proof yet light as a feather these waterproof men’s running shoes let you scamper up the gnarliest singletrack with the nimbleness of a mountain goat. Beryl Pixel Light: Stay safe out there—when you’re up before the sun rises or trying to make the most of dark winter evenings, this USB rechargeable two-in-one light will keep you visible in traffic. The versatile mount and velcro strap make it easy to fasten to your helmet, bag, or body during your workout. Your weekends (and, let’s face it, several “sick days”) aren’t complete without getting deep in some fresh powder. From the drive up to Tahoe to the post-ski beer, we’ve got you covered. 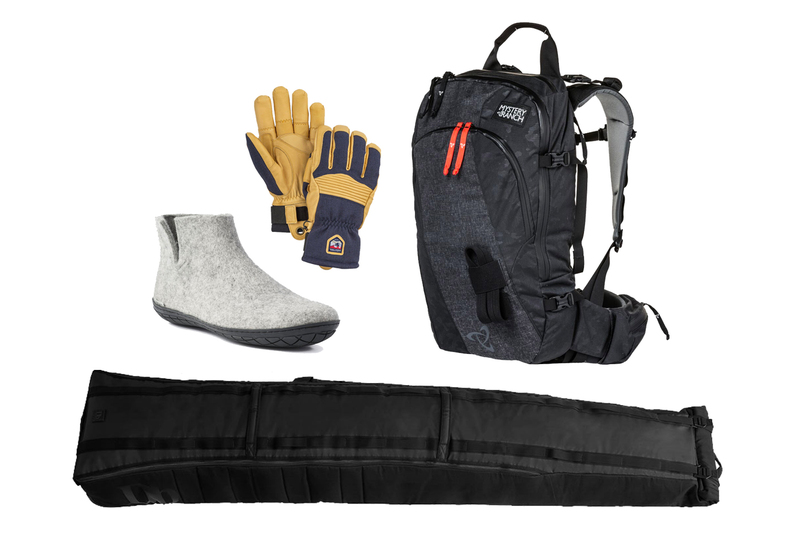 DB Equipment Snow Roller: This ski bag unrolls to protect your planks en route, thanks to its patented Rib Cage design. When not in use, it’ll roll back into the size of a small duffel for stowage. Mystery Ranch Saddle Peak Backpack: Once you’re on the slopes, carry snacks and gear in this 21-liter backcountry ski backpack, and when it comes time for hike-to terrain, strap your skis or snowboard to its back for the ascent. Hestra Army Leather Couloir: When dropping, enjoy the dexterity of the water- and windproof gloves. Their pre-curved goat-leather fingers allow for a great range of motion and extreme protection from the deepest powder and sharpest gusts. Glerups Boot: There’s no better feeling than returning from a day on the slopes, slipping out of your ski boots, and putting on something cozy. Level up your apres game with these Danish wool indoor/outdoor shoes, you won’t be sorry. Whether your Sunday routine involves a morning hike, an afternoon coffee date, or a full day of Netflix, we’ve got the outfit that can do it all. lululemon City Sweat Thermo Pullover: This comfy workout/kick-around pullover has an ergonomic design you’ll appreciate whether you’re reaching for the dumbbells or the remote. 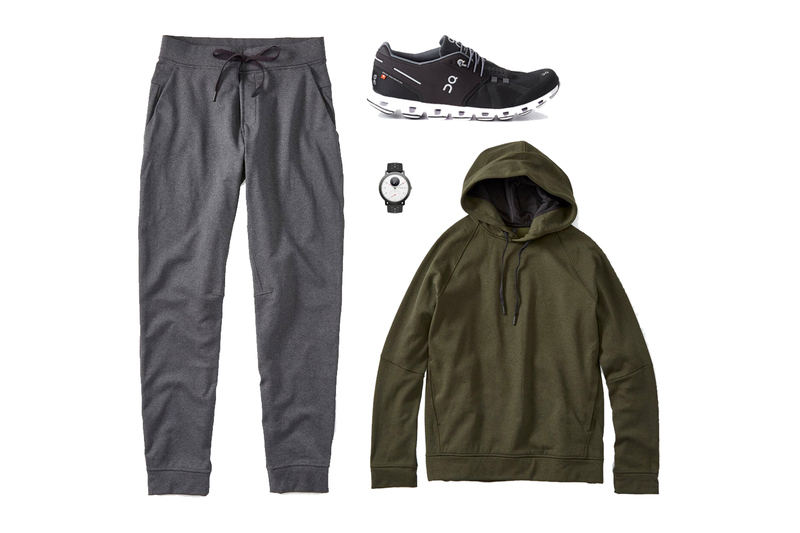 lululemon City Sweat Thermo Jogger: These crazy comfortable sweats perfectly illustrate how lululemon has single-handedly established the category of men’s athleisure. The sweat-wicking Tech Fleece performs awesome, even as these lululemon joggers are perfectly at home on the couch. On Running Cloud: Whether you’re jogging to the coffee shop or actively eating brunch, these running shoes offer all-day comfort with their innovative CloudTec outsole that cushions both verticle and horizontal pressure. Withings Steel HR Sport: Track your workouts and lunch dates with this activity tracker/watch hybrid, which records heart rate, sleep, GPS and 30 different kinds of workouts. And it comes with both a silicon and a leather strap, so you can dress it up or down as needed.